Boy this was one enormous cake. Huge slices, huge flavor, great texture. And a lot of work. I put the finely chopped (OK, it could have been more fine, but I'm impatient) into hot coffee. Normally, when recipes call for coffee I leave it out, since I really don't like the taste. But I was promised that the coffee in this recipe would serve only to bring out the flavor of the chocolate. And it was true. 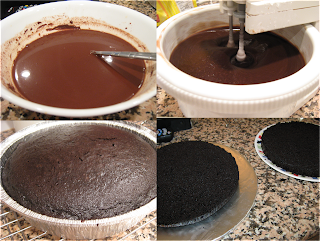 When I finally had the batter together - all the chocolate, coffee, cocoa, sugar, flour and all the rest - I baked it in two 10 inch round pans. That is one big cake. Of course I lined the pans with parchment paper - I wasn't taking any chances this time. Now here's where it gets interesting. Raspberry filling. I've been told numerous times that I must get over my raspberry obsession - but this time it was at the birthday girl's request. Pureed frozen raspberries, strained, then boiled with sugar and cornstarch. The straining! Oh, the straining. Took forever. I had to force every last drop through the mesh. Math. I used to like math. I could do it. But after a certain point, math gets really hard. Now it is no longer my friend. But I keep needing math to measure, bake, layer and decorate. And I keep screwing it up. 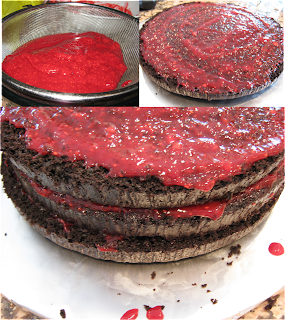 As I was layering these cakes (I split each layer in two - resulting in a four-layer cake) in my mind I was thinking that I also needed to divide the raspberry filling into four. Of course, you're all thinking - no, silly, you only need three. Because I wasn't putting filling on top. Now this occurred to me as well. Right about the same time I reached for the third layer. Now while there was no raspberry filling on the top, there was something else. This frosting. I don't think I have to tell you that this is goooood. This is my new go to chocolate frosting. And it's quick too. Now I know that if I was a little more professional, I would have flattened off the top of the cake, to make a nice, smooth surface. But, I'm clearly not a professional, and anyway - if you have to choose a nice smooth surface or more cake - which would you go for? Nothing left to do but eat! This was good. Really good. I never thought myself much of a chocolate cake fan, but clearly I haven't been eating the right chocolate cake. This was incredibly moist and soft, even two days later. A little more effort than normal (at least for me, Queen Lazy), but well worth it. Of course, this cake definitely isn't for everyone (what cake is) as evidenced by my friend who I caught whispering, "I don't like this" to another friend. Then when she looked up and saw me watching, she let out a dramatic gasp. Don't worry, everyone else liked it. Or were too scared to say otherwise. Tip of the Day: If you want your frosted cake to have a smooth outside look, use slightly wet fingers to smooth it down all over. Or opt for the natural look - either way it's delicious. Finely chop the chocolate and combine in a bowl with hot coffee. Let sit for a minute to melt and then stir to combine. In a stand or hand mixer, beat eggs until lemon-colored. Slowly add in oil, buttermilk and vanilla. Mix in chocolate/coffee mixture. Pour in sugar, flour, cocoa, baking powder, baking soda and salt. Divide batter between two 10-inch round cake pans lined with parchment paper. Bake on 350F for 1 hour to 1 hour and 10 minutes. Cool completely in pan. Thaw the frozen raspberries. Puree until smooth. Strain through a fine mesh strainer to remove seeds. Heat in a small pot with the sugar and cornstarch until it boils, then remove from heat. Bring the cream, sugar and corn syrup to a boil over low heat, mixing until well combined. Remove from heat and whisk in chocolate until melted and smooth. Add in butter until stir until melted and combined. Let sit until comes to room temperature. Do not refrigerate before use - it will harden.